On two hundred acres in the Hudson Valley, Amy Goldman grows heirloom fruits and vegetables--an orchard full of apples, pears, and peaches; plots of squash, melons, cabbages, peppers, tomatoes, eggplants, and beets. The president of the New York Botanical Garden has called her "perhaps the world's premier vegetable gardener." It's her life's work, and she's not only focused on the pleasures of cultivating the land and feeding her family--she's also interested in preserving our agricultural heritage, beautiful and unique heirlooms that truly are organic treasures. Over fifteen years, the acclaimed photographer Jerry Spagnoli has visited Amy's gardens to preserve these cherished varieties in another way--with the historical daguerreotype process, producing ethereal images with a silvery, luminous depth and a timeless beauty, underscoring the historical continuity and value of knobby gourds, carrots pulled from the soil, and fruit picked fresh from the tree. In Heirloom Harvest, Amy's essay, "Fruits of the Earth," describes her twenty-five year collaboration with the land. The text along with Jerry Spagnoli's photographs and an afterword by M Mark add up to an exquisite package, an artist's herbarium worthy of becoming an heirloom itself. 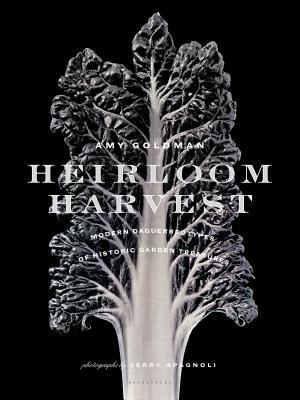 Amy Goldman is a passionate gardener, seed saver, and well-known advocate for heirloom fruits and vegetables. She is the author of The Compleat Squash and Melons for the Passionate Grower, and she appears frequently on such TV programs as Martha Stewart Living and Victory Gardens.